I just read an article in the USA today that asks the question, “Do toddlers really need computers to learn“? The article makes the case that young kids have too much “screen time” and not enough outdoors time. That may be true as a trend in the US, but to me, that’s really a parenting issue more than a problem with a certain type of toy or technology. 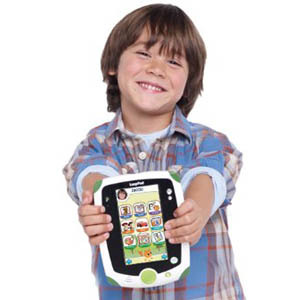 One of the hottest new “screen toys” this year is the LeapPad by LeapFrog. I listed it in my list of the 20 Top Toys of 2011. Every time I’ve been at a store and browsing the toy aisle this holiday season, the LeapPad is sold out, so I know demand has been high for this toy. I’ve also written previously about my kids experience with the Fisher Price iXL vs. the LeapFrog Explorer. These are great electronic learning toys for young kids. The LeapPad is suggested for Kids 4 years old up to around 9 year old. So it really isn’t a toddler toy. I’d have to agree with that. My Pre-school age kids love their LeapFrog Explorer and Fisher Price iXL — but our 1 year old don’t play with these toys much if at all. Personally, I think that these educational toys are great. My young kids also certainly love to spend time with my iPad and playing games on my iPhone. Many of the games we let them play have an educational value, while some are “just for fun”. As parents, we make sure to limit “game time” or “screen time” (including tv) so that our young kids are getting enough exercise and “real world”, not just “virtual world” play time. So overall, I have to disagree with the USA Today article and I think that these “computer toys” are great for young kids. But just like everything else, it’s most important for parents to monitor what their kids are doing and provide boundaries and guidance all along the way.